Paella is a popular Spanish Dish. The interesting story about this dish is that the word Paella, was developed from the standard Arabic word Baqiyah, which means Leftovers! However, in Egyptian-Arabic dialect the word Paella, is used. Back in history, when the Arabs used to rule Spain, the poor fisherman, who used to fish for the rulers, in addition to those who worked as servants at the rulers palaces were allowed to take the leftovers of the major catering prepared for the parties and banquets held by the rulers. Most of the leftover fish, chicken, and rice were taken away by the poor, who mixed them together for easier delivery to their homes. 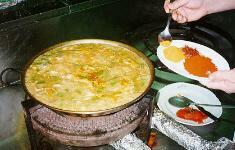 With time, the word Paella,(Baqiyah) became a popular Spanish dish. However, you dont get it now as leftover anymore.